Summary: This article will profile a new Lyme treatment, and one of the world’s leading physicians using the therapy. I’ve personally been treated by Dr. Mary Ellen Shannon, and I highly recommend her. You can contact her through her clinic, Center for New Medicine (Irvine, CA). She is an LLMD (Lyme Literate Medical Doctor). When I wrote my first Lyme disease book, Lyme Disease and Rife Machines, I discussed the benefits of ozone therapy. Ozone therapy is incredible for many reasons. Until now, however, I believe that ozone therapy has been limited because there are no superb ways to get enough ozone into the body. Don’t get me wrong – many of the ways in which ozone has been administered for the past several decades are good. They do work, and are useful. But they haven’t been life-changing or ground-breaking for many patients. That is, until now. A new method of administering ozone, called “ozone ten pass”, has been a game-changer for many Lyme disease patients. Let me explain what this is. Before ozone ten pass, the most powerful method of ozone administration was called MAH, which stands for Major Autohemotherapy. In simple terms, this is a procedure where a small amount of a patient’s blood is taken out of his or her body, and exposed to ozone, and then returned to the body. This practice has been performed for decades, especially in Russia and other countries where innovation is common in ozone therapy. MAH has helped many Lyme patients, no doubt. But still, it wasn’t really game-changing for the vast majority. This is why ozone ten pass is so exciting. A very smart researcher and leader in the field of ozone, Dr. Johann Lahodney, developed ozone ten pass as a way to get more ozone into the body. Essentially, ozone ten pass involves doing ten MAH treatments – all in one sitting! Blood is taken out, ozonated, and put back in the body, ten times, in about an hour. Dr. Mary Ellen Shannon, MD. Bryan Rosner has personally traveled to see her in Southern California, twice. Several years ago, ozone ten pass was new, and wasn’t widely available. However, as it has become more evident that it can be game-changing for not just Lyme disease but also many other conditions, more and more American physicians have begun to incorporate it into their practices. So it is a very good time to look into ozone ten pass, because it is much more available than it has ever been before. And furthermore, the training that doctors receive is more advanced than ever. One unique characteristic of ozone ten pass is that each subsequent pass in the treatment can help to neutralize toxins and clean up the mess left by previous passes. And this all happens in one sitting – one treatment. This doesn’t mean that patients don’t herx with ten pass – some of them do. But, the ten pass process introduces some new and intriguing variables and benefits compared to MAH alone. (Disclaimer: Don’t forget to work closely with your doctor to determine if you should start at a full ten passes, or start at a lower amount – the treatment is very powerful and should be treated with great respect). After researching ozone ten pass for Lyme disease, I’ve come to the conclusion that it is a BIG step forward in Lyme disease treatment. In fact, I personally have traveled to see Dr. Shannon twice. As I write this, I am in Oceanside, CA, where I am having consultation with her. Some Lyme disease patients report having dramatic results after their first few treatments (remember, each “treatment” consists of up to ten “passes” of ozone. So when I say “one treatment,” I mean one full ten pass). More and more anecdotal evidence is popping up all over the internet. 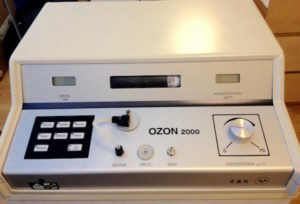 One physician has an entire YouTube channel devoted to testimonials of patients using ozone. Many of these patients are Lyme disease patients. I enjoyed watching his videos and hearing the many stories as I made my own preparations to undergo ozone therapy with Dr. Shannon. Also, I suggest you do a google search for “ozone ten pass Lyme disease” and read about many of the people who’ve been using this treatment. There are YouTube videos, blogs, Facebook groups, and other resources available. Of course, ozone ten pass does require a doctor to perform, so you’ll need to find a doctor offering ozone ten pass, or travel to go see one like I did. Which brings me to the doctor who I am profiling in this article: Dr. Mary Ellen Shannon, MD, of the Center for New Medicine, in Irvine, CA. Dr. Shannon has more experience administering this therapy than almost any other physician in the United States. In fact, she has administered this therapy on herself dozens of times, to cure herself of a serious life-threatening illness. I highly recommend watching her present on ozone and tell her story here. Even while ozone ten pass was new, and many physicians were very inexperienced, Dr. Shannon was using the therapy on herself daily, to regain her health. Hence, her experience, competency, and wisdom far surpass any other ozone doctor I’ve met or even heard of, with the exception of the inventor himself. If you are considering ozone ten pass, I highly recommend Dr. Shannon, and as mentioned, I personally received treatment from her. I screened a half dozen ozone doctors and chose her because of her extensive experience and personal journey with ozone. Her clinic is equipped with near-endless state-of-the-art advanced, integrative treatment tools (Dr. Shannon jokes that her clinic is the “Disneyland” of alternative medicine!). She is also a very warm, caring, empathetic individual, and she thinks outside the box in addressing Lyme and related conditions. She has extensive experience treating many neuro-degenerative conditions, as well as cancer. Every time I see her, she is telling me about a new cutting edge Lyme disease therapy she is using in her clinic. Likewise, she is very open-minded and willing to hear you out on whatever you have to say about your own unique healing challenges and any new treatments you are considering. As an ozone doctor and an LLMD, she is fantastic. Though it may be difficult for some people to travel all the way to Southern California to see her, I found that my own journey to this doctor was highly worthwhile. I’ve also found that ozone ten pass has played a huge role in my ongoing recovery. Feel free to leave a comment below with thoughts or questions. You can contact Dr. Shannon at 949.680.1880 or through the clinic website. I’ve personally used MAH (where a pint of blood is taken out and infused with ozone) weekly for two and a half months as well as having the oxygenated blood run through infared light. To be honest, for the money and time it takes I wasn’t impressed. Antibiotics did far more for me for much less money; however, I knew about this ten-pass approach and begged my LLMD to do it as German doctors are using this approach for cancer with good success. I truly feel it’s dose dependent. For those of you in CA, this may be a game-changer for you. Let me know how you progress. The beauty of it is it will deal with ALL infections – including viruses.